Layfield has been involved in irrigation canal and pond construction since the company was founded in the 70's. We have regularly supplied PVC and RPE canal liners for irrigation districts and have built innumerable irrigation ponds for parks, gold courses, and agricultural facilities. Layfield's featured product for irrigation markets is our RPE geomembrane material. This light weight, cost effective liner material is an excellent seepage control liner for canals and ditches in irrigation districts. 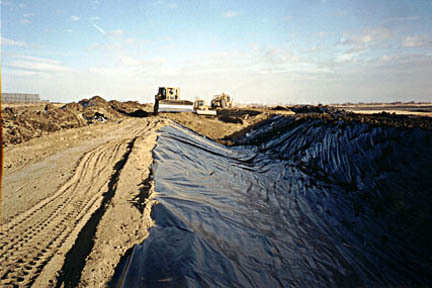 For over 30 years Layfield has provided this unique material for seepage control in fabricated panels as large as 100,000 ft2 (10,000 m2) in a single piece.